Yesterday, I posted my last New York City recap, featuring my lunch at Chop’t Creative Salad Company. I never would have known about Chop’t as a great vegan, gluten-free dining destination that also is fantastic for those who eat meat (my husband), unless I read blogs. It was Gena’s blog in particular in which I first learned about Chop’t, so thanks to her, when we were looking for a lunch spot with plentiful salad options, I was able to point us in the right direction. I have learned about so many cool and interesting foodie spots and restaurants around the country from reading blogs that I feel I have quite a list now of places I must try if I were ever to land in those particular cities. I thought it would be fun to highlight my favorite blog posts this week that highlighted cafes, restaurants, coffee shops or other places of culinary interest that I wish I could try one day. Here’s to wishful eating! 1) Best Salad Spot (besides Chop’t! ): Gena of Choosing Raw did it once again. . . this week she featured an ode to one of her favorite Washington D.C. spots known for its vegan-friendly offerings, particularly in the realm of huge, bountiful salads. Sweetgreen, a chain of eateries, is where Gena goes to to get salads loaded up with local, fresh ingredients that often extend beyond what any typical restaurant salad has to offer (local strawberries anyone?). My bro lives in D.C., so when I go visit him next Sweetgreen is officially the first place I will go to for lunch since Gena speaks so highly of it! 2) Best Pizza: Speaking of Washington D.C., Elise of Hungry Hungry Hippie posted some awesome recaps of her recent shenanigans in D.C. Her post about eating pizza in D.C. was so incredibly informative– not only did she do a great review of District of Pi, where she found not only vegan but gluten-free pizza, but she so helpfully listed a bunch of D.C. pizza spots that are vegetarian, vegan, and/or gluten-free friendly. Run on over to her blog to read about the incredible vegan, gluten-free pie she enjoyed in our nation’s capitol, one that I hope to also devour when I go visit the bro! 3) Best Salad Bar I Want To Ransack: Besides Gena, I think I can also relate to Janae’s (of Hungry Runner Girl) salad-loving ways. I have read many a post of hers in which she attacks a salad bar like no other, producing salad beasts of epic proportions that make me drool. Just this week, she discussed her latest salad bar acquisition at a spot called The Pizza Factory. Check out her post if you want to see not only how huge the salad bar seems, but how delicious her salad looked! I know if I ever find my way to Utah and I need a big salad I can customize to my preferences, I just have to find The Pizza Factory! 4) Best Celebrity Chef Vegan-Friendly Spot: When I went to New York City a year ago, I was still eating dairy and gluten. I took many of the suggestions of Lynn, from The Actor’s Diet, in terms of where to get food. I remember finding the incredible Doughnut Plant in NYC thanks to her review of it. 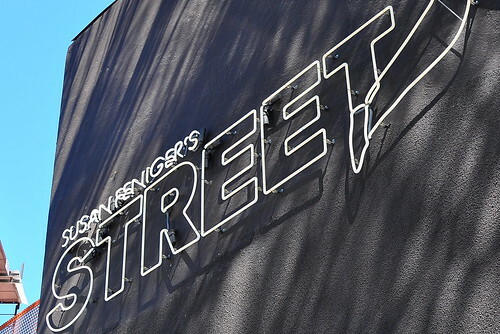 This week, she posted about Street, a hotspot owned by Susan Feniger, whom I fondly remember from Top Chef. Lynn ate a whole bunch of incredibly amazing-looking vegan dishes at Street, including vegan pizza and spicy millet puffs, as well as an off-the-hook gluten-free vegan dessert you can read about in her post. I would have never known about this vegan-friendly establishment in Los Angeles without Lynn’s review, and since I plan on being in Los Angeles perhaps this summer, I know now one place I am definitely going to visit for some creative and inventive eats. 5) Best Tea Shop: You all know I often enjoy my favorite almond rooibos from Tealuxe here in Providence to fight off the usual 4 PM exhaustion I experience on workdays. While I don’t drink tea in the morning, I love it as an afternoon pick me up. When traveling, if I ever were to stumble across a tea shop, chances are I would stop in to pick up a cup to keep my energy up for exploring the new place. Recently, Meghann of Meals and Miles posted about TeBella, a small cozy shop loaded with a variety of unusual and exotic teas on Davis Island, Florida. I don’t know if I will ever make it there in my lifetime, but I will always keep TeBella in mind– a great tea shop is pretty hard to come by on vacation, and I wish we had similar tea shops in Providence other than my beloved Tealuxe. I bet you next week, after reading my favorite blogs, I will add another five places to my foodie bucket list! Has reading blogs inspired you to try cetain new-t0-you places? What have been your favorite foodie finds from other bloggers’ posts?